I may never go back to proofing yeast and kneading and punching and kneading some more. Why? Because the Artisan Bread In Five Cookbook has changed the way I bake. I bake in quantity with such ease. I made three loaves of sandwich bread from this 5 minute dough I made yesterday. 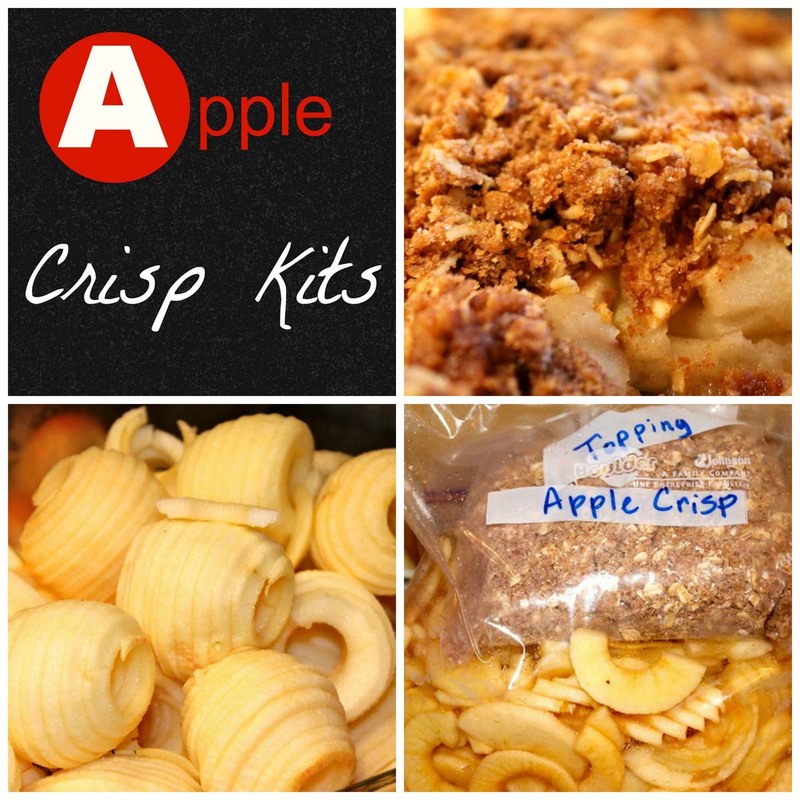 You simply measure the ingredients, mix it up and let it set on the counter for 2 hours and stick in your fridge. 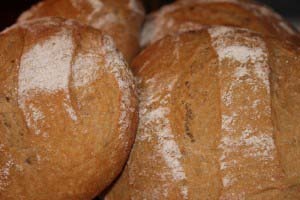 The next day or up to 4 days later, you can make 3-4 loaves or 1 loaf at a time. I’m spoiled. Because I’m a freezer cook, I always choose the abundance route. I made two loaves and one free form loaf so you could see the process. I sprinkle flour on top of my dough and visually split the entire amount of dough into thirds. 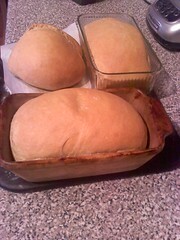 I flour my hands and form them gently into loaves and place them in a sprayed pan or make a cute round loaf. I set mine on parchment paper. I allowed the loaves to rest for 2 hours. The authors suggest at least 1 1/2 hours of resting time. Slash the free form loaf before baking. Bake at 450 for 45-50 minutes. I brushed mine with honey butter and let them cool in the pans for fifteen minutes and then transferred to a cooling rack. I allowed them to cool completely and then sliced with an electric knife. I have a guide which helps with thin equal slices. 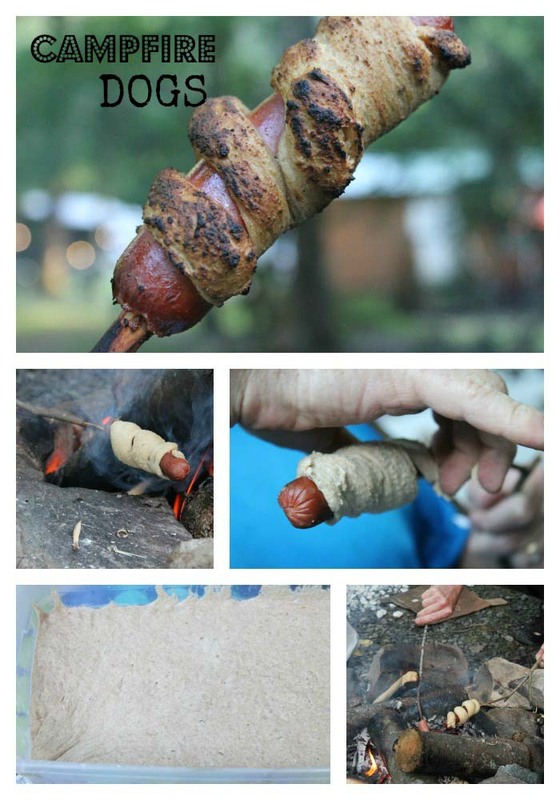 A serrated knife will work also. Even when I sliced my bread, it was slightly warm. When it’s completely cool, I wrapped in plastic wrap or foil for the freezer. 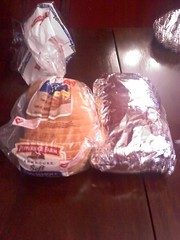 Double wrap in regular foil or slip the loaf into a gallon size bag for extra protection. I reused a store-bought bread bag and we’ll eat this bread in the next 2 days. If I don’t have plans for sandwiches in the next 2 days, I freeze mine. Thaw prior 12-24 hours at room temperature prior to making sandwiches, french toast, Pananis and more. Reuse the ends or old bread by grinding in a blender and store in your freezer for fresh bread crumbs. Or cube and toss with olive oil and seasonings and bake to make homemade croutons. I used the canola oil recipe, but I’ve also used the olive oil recipe. This dough works well for calzones, pizza, stromboli and cinnamon rolls. See Artisan Dough 101 post for a measuring and mixing tutorial. Imagine having loaves of fresh homemade sandwich bread in your freezer. You might give one away since you’ll have more than one loaf if you attempt this recipe. 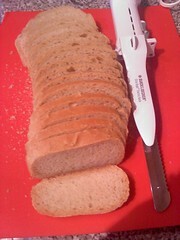 This entry was posted in Quick + Yeast Breads, Tips/Tricks and tagged artisan dough, baking homemade sandwich bread, canola or olive oil dough, cooling, freezing, slicing, storing on 10.03.2011 by admin. Is it 450 or 350, I noticed the Cinnamon Raisin Bread was 350 and am making this for a softball tourney and want to get it right. Thanks. When freezing this, do you let it sit out for the 2 hours and then freeze, or do you freeze immediately and let it rise later when you are actually going to bake it? You can freeze the dough after the 2 hour rise time, but the dough has to be room temperature to rise again and bake well in the oven. After thawing the dough 24 hours in fridge, allow to sit on counter for 90 minutes. If choosing this route, I’d definitely add 1/4 cup vital wheat gluten to help with a better rise. However, I like to bake right away for the best rise possible and w/o having to use vital wheat gluten. I like to bake three to four loaves at one time and then freeze the loaves for convenience. Hope this helps!